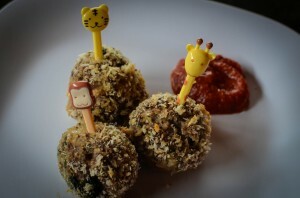 These baked meatballs are yummy in my tummy! My friend Nora said it was the best meatballs she has ever had. 😀 Serve them with organic pizza sauce for dipping! Dump all ingredients and 1/4 cup of the bread crumbs in a bowl. Mix well. Roll them into balls the size of a ping pong ball. Put some of the remaining bread crumbs in a mug. Place a meatball in, and shake it around to coat the meatball. Place on a baking sheet. Repeat with all the meatballs. Bake for about 20 minutes, or until golden and cooked through. We’ve made these for dinner twice, and love them. Thanks for the recipe! A question – how do you recommend doing these for school lunches? Do you make them ahead and freeze them, and then defrost/heat a few at a time for packing into the lunchbox? And what do you find is the best way to reheat in the morning prior to packing? BTW we just ordered the laptop lunch boxes – kids are excited for them to arrive! Yay, thanks Jenny! We keep it in the refrigerator and just pop them in our lunches in the morning. They thaw by lunchtime, and I don’t mind cold meatballs 😀 You can freeze them too. The best way to reheat them is probably in the oven, so the breading gets crispy again. I hope you like your laptop lunchboxes – aren’t they cool?